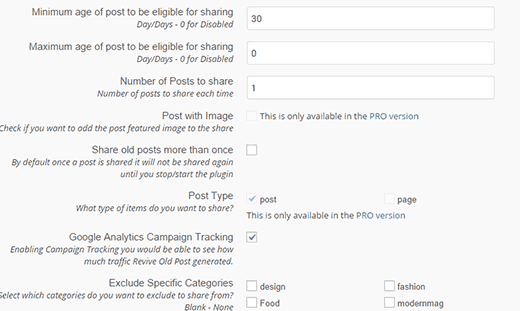 This WordPress Plugin Share Old Post of your Blog Automatically again, If you Want. Hello Folks,…… This WordPress Plugin Share Old Post of your Blog Automatically again because Social networks are an important source of traffic for many websites. You can use social networks like Twitter, Facebook, and LinkedIn to introduce your new followers to your old content. This helps you engage users on social media, build a strong following, and bring traffic to your website at the same time. In this article, we will show you how to automatically share old post in WordPress to keep them alive and fresh. First thing you need to do is install and activate Revive Old Posts (Former Tweet old post) plugin. Upon activation, the plugin will add a new ‘Revive Old Post’ menu item in your WordPress admin bar. Clicking on it will bring you to the plugin’s settings page. Your behalf. To do that, you need to connect the plugin to your Twitter, Facebook, and Linkedin accounts. Simply click on the button next to each social network and follow the instructions on screen. If you do not wish to use a specific social network, then you can skip it. By default the plugin allows you to connect to Twitter and Facebook. In order to connect a third network, you will need a pro account. The premium version of the plugin costs $24.99 for a single site license and comes with extra features like ability to post with an image, and add multiple accounts. Once you have connected your social media accounts, you can configure other optional settings. Revive or share old post allow you to choose how many posts you want to share and the time interval between each post. This option will allow you to see how much traffic Revive Old Posts is generating for your website. You can also choose how old a post needs to be in order to be shared. 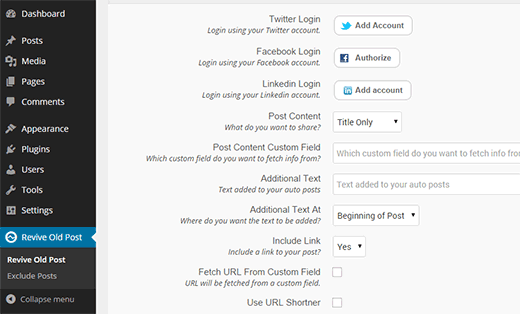 Revive old posts also supports custom post types, so you can choose which post types to share on your social networks. Lastly, you can exclude particular categories if you need. Once you are satisfied with the settings, you can click on see sample post button at the bottom. This will bring up a popup showing how your post will appear on your social networks. If everything looks alright, then you need to click on the Save button to store your settings. To start sharing, you need to click on the Start Sharing button at the bottom. That’s all your website is now ready to share old post in WordPress. The plugin will automatically share and Tweet old posts to your social media accounts with the regular interval you defined in settings. While Revive or share old post is a great plugin, some people want a bit more control over the content that gets shared specially when it’s an old post. Not all old posts on your site are worthy of re-sharing. That’s why we use a combination of two tools (BulkBuffer and BufferApp) to share our old posts. Basically, we hand-pick a list of our old articles that’s worthy of sharing and organize them in an excel spreadsheet (one-tweet per line). Next, we upload it to Buffer using the BulkBuffer tool. This way, we have full control while automating most of the process. We do this once a month to keep our spreadsheet fresh. We hope this article helped you share old post in WordPress. If you’re not sharing your old posts, then we recommend you start doing it right away because you’re missing out on traffic. So, Friends this is all about This WordPress Plugin Share Old Post of your Blog Automatically again, If you Want. Hope you enjoy it. 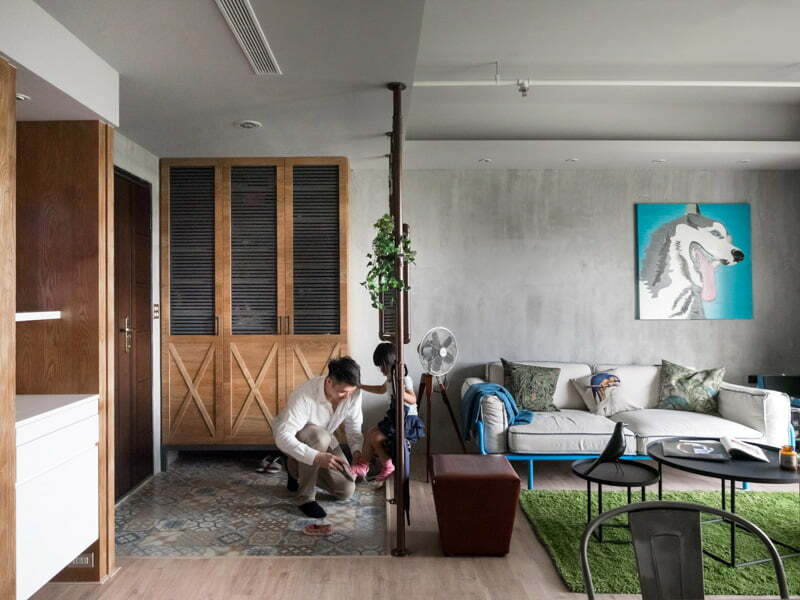 Did you know this Family Playground Create inside House Design? Does it mandatory to provide and link aadhaar card with mobile number?